Recently, a CEO was speaking to us about what he keeps top of mind. His priority is to track the personal growth of those who work most closely with him. Here is the process we designed to make this most effective. 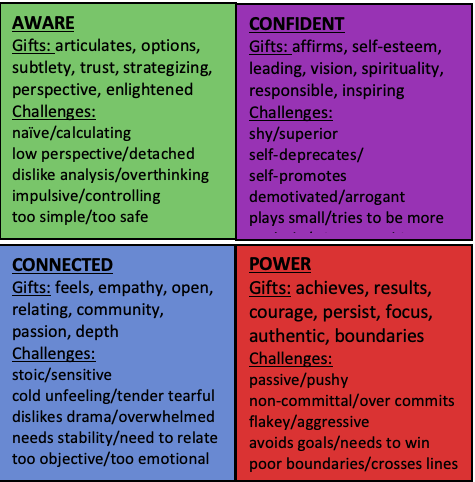 Use the image above and consider in which of these areas is their gift, and in which is their challenge. What is their impact on others? What benefit happens when they show up? What creates difficulty? Come up with your own words for exactly what their gift is; and their challenge. Perhaps they’re a high-achiever that gets results but does so at the expense of satisfying relationships with their colleagues. Or maybe they’re inspiring and charismatic but are unaware of how others see them. Once you have settled on a gift and a challenge, notice how they’ve grown in each area in the last month. How has their gift become more potent? How has their challenge become easier? Then acknowledge the person for the movement they’ve had in each area. After you’ve acknowledged them for how they’ve grown, then you can turn your attention to what is next for them. Look at the trajectory they’re on, and where is it going in each case? What is next for them in bringing their gift to others more powerfully? How can they continue to grow in their area of weakness? For one a team member, his gift was that he can see opportunities before they manifest. He can pick a business or a process that is going to bear fruit, and he can smell one that is going to hit trouble. He looks at a situation and sees its future unfolding and calls it right most of the time. His challenge was that he upset people without knowing it. His self-talk was, “I’m doing good work therefore everyone should like me.” People weren’t getting the acknowledgement that they want from him, and sometimes he did things that dismissed or disrespected them. He came late to meetings, made comments he didn’t realize were cutting and accentuated blame whenever anything went wrong. As part of a larger transition, he needed to develop a more nuanced approach. The team leader helped him see the value of his gift and how much more effective he could be with the support of his colleagues, rather than their distance and dissent. They began by asking for people’s feedback, then created the practice each evening of taking ten minutes to contemplate the impact he had that day on other team members. Now he understands how other people are feeling about him. Instead of being right, he’s open. His group’s numbers are knocking it out of the park.